Should Spouses File Bankruptcy Together? At Nowack & Olson, we hear from married couples wondering whether they should file for bankruptcy together. 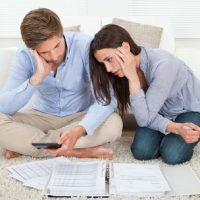 While it is certainly possible for married couples to file a joint bankruptcy, this is not the right move for every couple to make. Before filing jointly, you should consider how a bankruptcy will impact you as a couple. Some of these debts might only be in the name of one spouse, which means that only that spouse is legally responsible for the debt. If so, then this spouse can eliminate the debt by filing for bankruptcy him or herself. However, if the debt is in both of your names, then your spouse filing bankruptcy will only relieve him or her of responsibility. You will still remain on the hook for the entire debt because it is also in your name. Look at the debt and identify who is legally responsible for it. If you both are on a debt that you want to discharge, then filing jointly can make sense. In a Chapter 7, the trustee can sell assets and use the proceeds to pay unsecured creditors. Before deciding whether to file jointly, you should look at the property that each spouse owns. For example, one of you might have come into the marriage with significant assets. Those assets are at risk if you file for bankruptcy jointly. In Florida, most assets you acquired jointly will not be considered part of the bankruptcy estate. Nevertheless, you should meet with a Florida bankruptcy lawyer to fully analyze how your assets will be affected. If you and your spouse have wildly divergent incomes, then applying jointly could put you over the income threshold. If so, then only one spouse should apply if he or she has the debts you want to wipe out. Bankruptcy will tank your credit score—there are no two ways about it. Even though savvy consumers can slowly rebuild credit, the bankruptcy will stay on your report for years and your score could be low for a long time. Consider whether one spouse needs a good credit score in the next few years. Couples contemplating bankruptcy have many issues they need to think through before applying jointly for relief. At Nowack & Olson, we have advised many couples about how bankruptcy will affect them, and then we have guided them through the bankruptcy that they have chosen. With locations in Miami, Jupiter, Boca Raton, and Plantation, we are never too far away. Pick up the phone and schedule a free consultation by calling 866-907-2970.